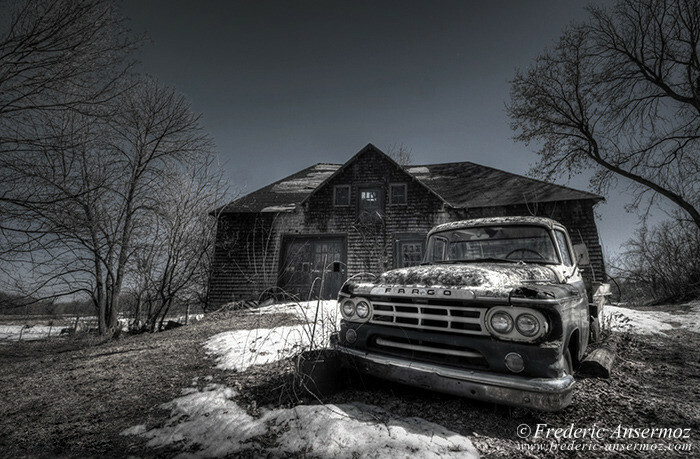 Here are some photographs of an old Fargo truck, that I took beside an abandoned barn near Montreal. 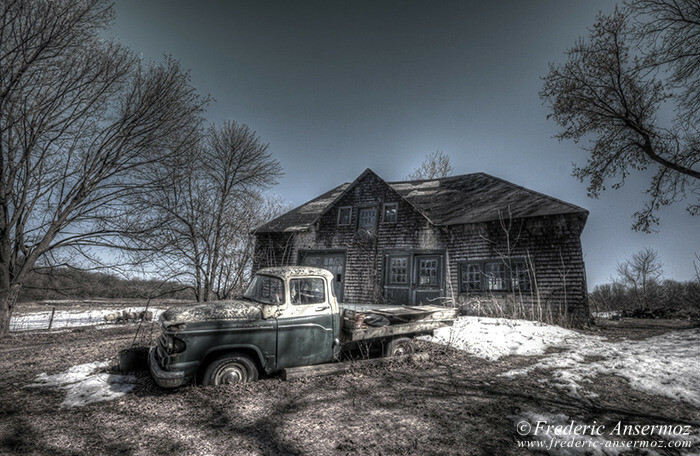 I used the HDR imagery technique, in order to create those images. 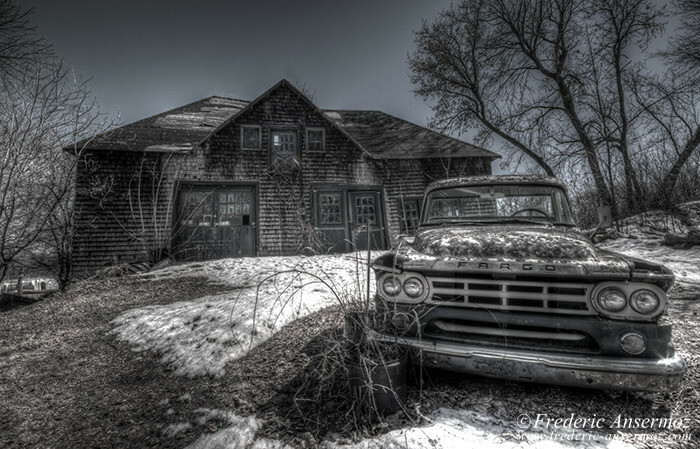 I will post an article about HDR photography soon. 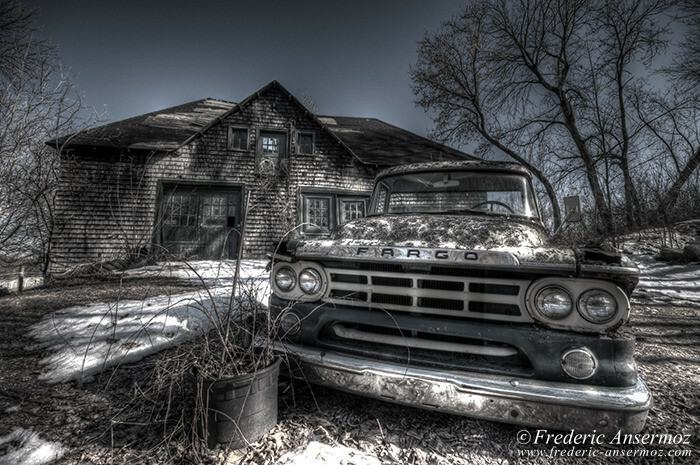 I hope that you will like the pictures and the Fargo truck! Fargo brand was used worldwide. 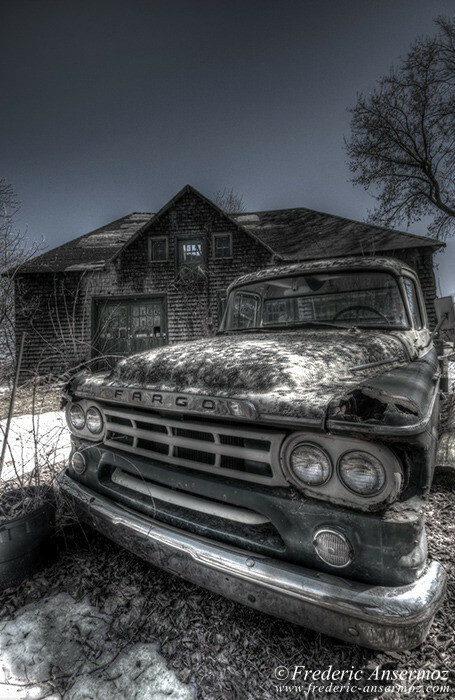 It started with the Fargo Motor Car Company of Chicago, which sold a line of Fargo trucks from 1913 to 1922. In 1928, Chrysler bought the company and created the Fargo Motor Corporation to build and sell commercial trucks. 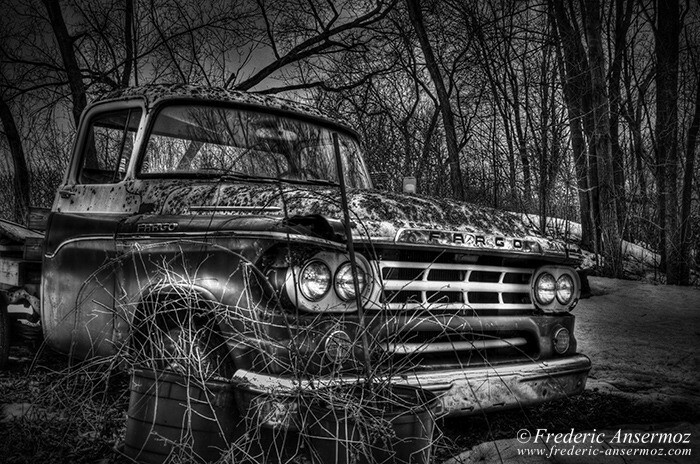 The Fargo name also related to Joe N. Fields, Chrysler Sales V.P. and President of DeSoto, who had started his professional life selling farm machinery in Fargo, North Dakota (the famous place in the Coen’s brother movie). Fargo vehicles were using parts of Plymouth, DeSoto, and Chrysler vehicles. Despite a wide range of models, from light express and delivery vehicles to heavy dump trucks and semi tractors, Fargo seemed doomed from the start. Chrysler bought the Dodge Brothers Company, almost after having decided to create the Fargo Motor Corporation. Chrysler has now three truck lines: Fargo, Dodge Brothers, and Graham Brothers Trucks (built and marketed by Dodge Brothers since 1921). Instead of selling Dodge trucks with their own name abroad, Chrysler used the Fargo name to export its trucks. 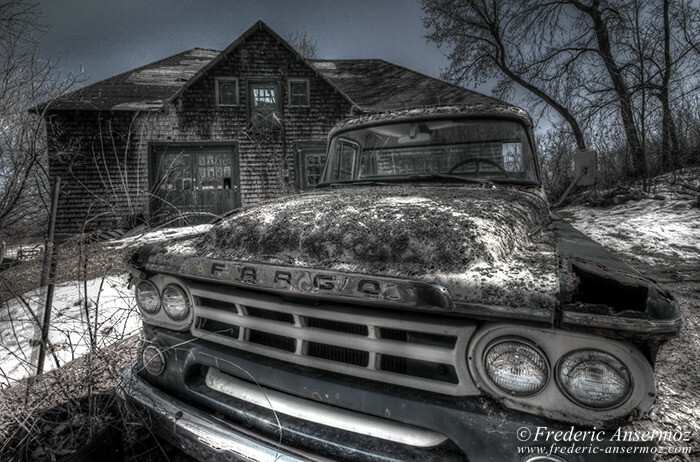 Fargo trucks for most countries were made in the United States, though all Fargos sold in Canada were made in Canada. The Canadian corporation had two divisions: Chrysler-Plymouth and Dodge-DeSoto. The Canadian Fargo was introduced in 1936, and was available from half-ton to three ton ton sizes. Trucks larger than 3 tons were imported from Detroit. In advertising its new Fargo, Chrysler Canada took no chances with the public guessing where it was made. For about twenty years, every ads contained some variations of the byline, “Built by Chrysler … in Canada.” And the American name seemed quite Canadian. In 1937, Fargo production climbed to some 1824 units and then dropped to 1327 in 1938. By the time Canada entered World War II in 1939, many Fargo and Dodge trucks were made for military duty (6,000 civilian-style Fargo vehicles were produced, likely for military use across the world). 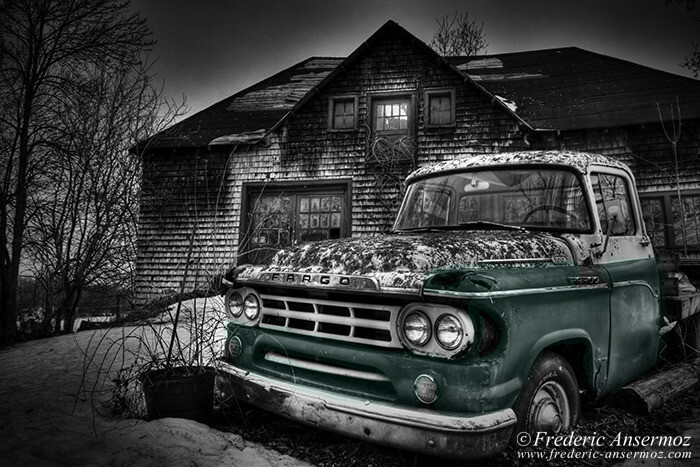 The first Canadian Fargo truck with a V8 was bluilt in 1955, a 3-1/2 ton model. In 1959, Fargo ads called these trucks as pickups, for the first time (previously called “express bodies”). But most of Canadians never called them “pickups”, considering it as an American term. 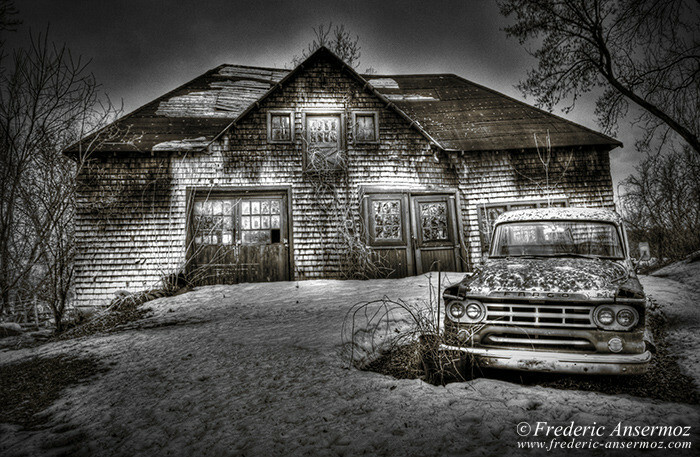 U.S. sales were discontinued in the 1930 (reaching just 7,680 vehicles since the 1928 introduction), but the name Fargo was used until 1972 for Canada, and lived longer for other countries around the world. Theories on why Chrysler used the name Fargo include the imagery of open range of the American west, symbolized by the city of Fargo and the Wells-Fargo stage lines, while another theory assumes there was a play on the words “Far” and “Go”, denoting durability. The Fargo brand still exists in Turkey, where Fargo and DeSoto trucks are still made by the manufacturer Askam, with no technical or business connection with Chrysler, which left its partnership in 1978. Askam is currently owned by Ciftciler Group. 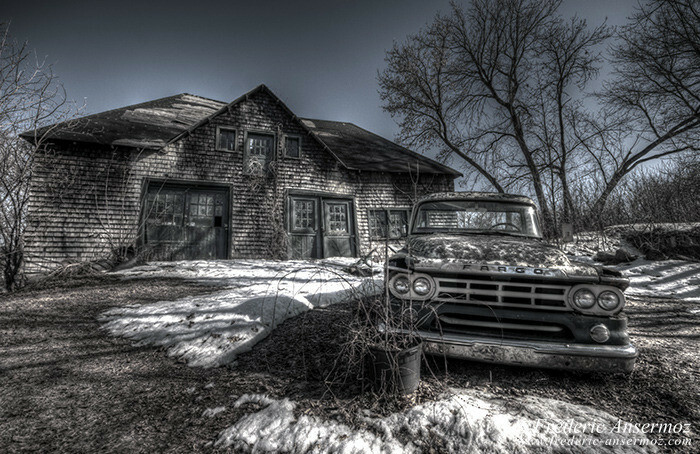 [What] Tags: Barn, Canada, HDR, HDR Photography, Truck.